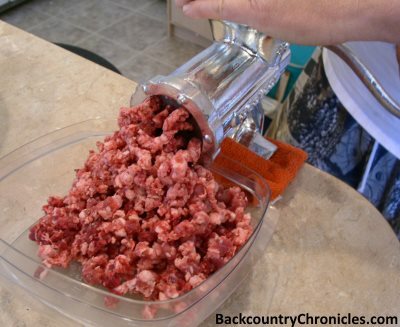 Stuffing elk sausage into casings with meat grinder. Meat was cured with curing salt and trays and bowls were placed in freezer prior to stuffing. 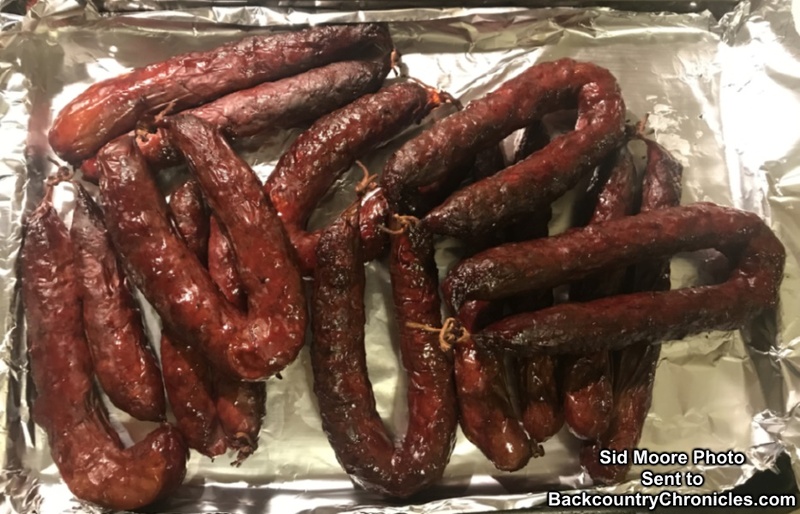 You have probably heard that curing your own meat and making your own jerky and sausage can be dangerous. Just like making potato salad, if you allow food to get contaminated and then allow bacteria to incubate, it can make you sick or even kill you. So there are a few safety considerations when making your own jerky, curing meats or making sausage. But before you give up and decide to leave curing meat and making sausage to the professionals, consider this: In 2011, the Center for Disease Control (CDC) estimated 48 million people got sick (1 person in 6), 128,000 were hospitalized and 3,000 people died from eating contaminated food (CDC 2011). The vast majority of these illnesses were caused by a few giant food processors that control the beef, pork and poultry industry in the U.S. These processors are allowed to police themselves under the Hazard Analysis and Critical Control Point (HACCP) system used by the USDA. If the professionals make one out of every six people sick each year, I think we can do a better job ourselves if we know what the dangers are and have plans and processes to deal with them. Remember, every single ounce of beef, pork and chicken that has been recalled was supposedly inspected by your federal government and the giant food processors that basically tell the government how they want to be managed. It’s possible for a person with a good immune system to do everything wrong and still not get sick. But there are contaminates like Botulism that are potentially fatal to everyone, so we must assume that people will get sick if they eat contaminated food, especially those with compromised immune systems. The reason we have immune systems in the first place is to kill invading bacteria, most of which enters our bodies through our mouths. Each of us eat millions of bacteria everyday, but we don’t get sick because not all bacteria are pathogens and because most of us can ingest small amounts of some pathogens without getting sick. We have to be careful because different people have different immunity to various pathogens. I can eat things that have no effect on me, but make my wife sick. You may be able to eat a tainted hamburger with no problem, but that same hamburger may kill your children. How Does Meat Get Contaminated? Normally, wild and domestic animals (and humans) are walking around with organisms like Salmonella and E. coli in their intestines. Unless they have wounds or infections, the meat will be almost completely “germ free” while they are alive. But the instant an animal is shot or cut, bacteria can be introduced into the meat. If the intestines are punctured, E. coli and other pathogens can get on and into the meat. Bacteria can also get onto the meat from the soil, from the animal’s feet or the hide. Contamination can also come directly from people handling the meat. If we assume all meat gets contaminated, them to make sure the meat is safe to eat, it must be properly handled, dried, cured and/or cooked to kill all pathogens. Since we have to grind or slice meat before we can add curing agents or cook the meat, we must also do everything possible to prevent pathogens from multiplying in the first place. According to the Center for Science in the Public Interest, poultry and ground meat have the highest risk factors for causing illness. This is due to improper handling during butchering and packaging. Steaks and roasts have a medium risk factor because they are less vulnerable to contamination than ground meat or raw sausage. Hand grinding elk meat and beef fat. Start with cold grinder parts and grind small batches so it can be returned to the refrigerator quickly. The risk is lower for roasts and steaks because only the outside of those cuts (usually) are touched by contaminated hands, knives or surfaces, but all parts of ground meat and sausages have the potential for contamination as every morsel has been ground and mixed together. The problem is especially bad with mass produced ground meat because many different animals are involved and that increases the chance for the entire batch to be contaminated. Grinding and mixing also increases the amount of Oxygen, which increases the growth of aerobic microbes. Combine that with the probability that ground meat spends more time at warmer temperatures, the chance of bacterial growth increases further. Since most sausages are made by grinding meat, they have a high risk for contamination. Also be aware that some meat processors mechanically tenderize steaks, meaning the steaks have been stabbed many times to break up the fibers (Mechanical Meat Tenderizer). Mechanically tenderized steaks would have an increased risk of contamination, but since the USDA does not require labels on mechanically tenderized meat, you may not know. White-tailed deer at check station. Doe had not been field dressed when it arrived. 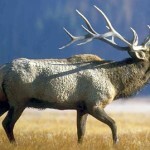 The risk of contamination from many animals is a good reason you should process your own deer or elk. 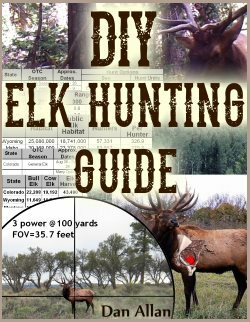 Many game processors mix all the deer or elk together (deer with deer; elk with elk), so you have no way of knowing how everyone else handled their wild game before it got to the processor. A friend dropped his deer off at a game processor and started to leave, but was told to wait a few minutes and they would load him up. 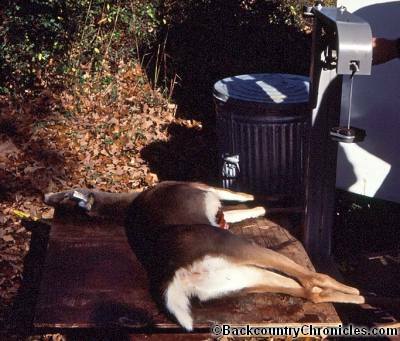 He left with meat, but none of it came from the deer he shot. I’ve seen too many deer and elk in the back of trucks that still had the guts in them many hours after they were killed. And people wonder why game tastes “gamey”. Given the fact that contamination is likely, you must take steps to prevent the spread and growth of the contaminates. 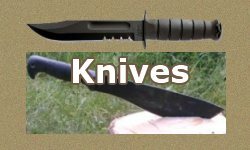 Clean – Wash hands, knives, utensils, cutting boards, bowls and grinding parts before and after every use. Separate – Keep clean hands, knives, utensils, cutting boards, bowls and grinding parts separated from dirty ones – keep cured or cooked meats separate from raw meats. Chill – Keep all meat, bowls and grinding parts as cold as possible. Marinate in the refrigerator. Cure and/or Dry and/or Cook – Use correct amount and type of Curing salt and/or heat all meat and jerky until minimal internal temperature of 160°(F) is achieved (165°(F) for poultry). You’ve all seen this before, but seriously, wash your hands with warm water and soap for at least 20 seconds before and after handling food, using the bathroom or handling pets. Wash cutting boards, bowls, knives, utensils and counter tops with hot soapy water before and after preparing each batch of ground meat or sausage. Consider using paper towels or have many clean hand towels ready for use. Using gloves can help keep things clean, but only if you can put them on and take them off without contaminating the gloves or other items. Remember all the trouble the health care workers had removing gloves contaminated with Ebola? Bacteria are spread by cross-contamination. When handling raw meats, keep the meat and the juice away from plates and food that is ready to eat. Keep bowls of meat on the bottom shelf in the refrigerator so they can’t drip on other items. Always start with clean hands, boards, bowls, knives, utensils and counter tops. Remember that a contaminated hand that touches a clean glove, bowl or hand towel contaminates that item. Food that is kept between warmer than 40° and less than 140°(F) (4.4° – 60° C) is in the danger zone. That is because bacteria can grow on food stored between those temperatures. Food that alternates between the counter top and refrigerator during processing can grow more bacteria each time it warms up. All refrigerators should be set to less than 40° F. All food that has been cooked should be kept higher than 140° F until served. Remember this next time you eat at a buffet or are forced to try Aunt Edna’s potato salad at the family reunion. So how do we grind meat, slice jerky or make sausage and keep the meat cold? Keep all bowls, grinder parts and meat cold until used. Meat and fats can be cut into strips and partially frozen prior to grinding. Grind small batches so all meat, bowls and grinder parts can be returned to the refrigerator or freezer quickly. Use bowls of ice to keep meat cold when it can’t be held in the refrigerator or freezer. All meat should be thawed or brined in the refrigerator or a cooler to prevent the outer portions from rising above 40° F.
Since we must assume the meat has been contaminated, we must assume that bacteria will be multiplying on and within the meat anytime the temperature is above 40°F. To counteract spoilage, man has cured meats with saltpeter (Potassium nitrate) since the Middle Ages. Curing prevents or slows spoilage due to fungi or bacteria. Modern curing salts are a mixture of table salt and Sodium nitrite and contain a pink dye to mimic the color of fresh meat. The meat industry likes to say that consumers prefer the look of cured meats compared to meat that would otherwise have a grayish color. That may be true, but since I know it is only a color difference, I would prefer not to have the dye, but have not been able to find a source. But since curing salt can be toxic if too much is used, the color also helps to distinguish between normal table salt. Note: Always label Curing Salts properly and keep out of reach of children. Curing Salt comes in two types Curing Salt # 1 (A.K.A. Prague Powder #1 or Pink Salt #1) and Curing Salt #2 (A.K.A. Prague Powder #2 or Pink Salt #2). Curing Salt # 1 is used for meats that require a short cure, meaning the time between grinding and seasoning to cooking and consuming is to be relatively short. Curing Salt # 1 contains 6.25% sodium nitrite and is for products like fresh and smoked sausages and corned meats that will be cooked or frozen immediately after processing. Curing Salt # 2 contains 6.25% sodium nitrite and 4% sodium nitrate and is for products like hard salami and country ham that take weeks or months to cure. The time period is long enough that the sodium nitrate should be converted to sodium nitrite. Curing salts are a necessary precaution against Botulism when making sausage. The cause of botulism is Clostridium bacteria, which require a warm, moist, slightly acidic, oxygen free environment. That is exactly what happens when meats (especially sausages) are slow smoked. Clostridium bacteria are easily killed when cooked. Even if they are allowed to grow, the toxin which causes botulism is easily destroyed by cooking to 176° F (80°C). Are Nitrates/Nitrites used to Cure Meat Bad? 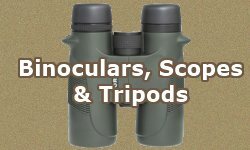 Perhaps this should be a separate post, but since we are discussing curing salts, this is probably a good place as any. After much research and deliberation, we have made the educated choice to continue using curing salts that contain nitrates and nitrites. There seems to be lots of unclear information about the dangers of these compounds in cured meats. Many processors are using “Natural” cures derived from celery seed. The problem with that is the amount of natural nitrate/nitrite in celery seeds is and unknown quantity, but much higher than found in curing salts. We know the exact amount of nitrate/nitrite in curing salts and we know exactly how much to use to protect our food. In other words, your spit contains far more nitrites than anything you could ever eat. This is because our bodies concentrate nitrites in the saliva to fight bacteria in our mouths and stomachs. I am no longer afraid of eating nitrates or nitrites from cured meats. That does not mean I think it is healthy to eat cured meats every day and it is a decision everyone has to make for themselves and their children. If you refer back to the section about keeping food out of the danger zone, you will remember that foods should be cooler than 40° and more than 140° (F) to keep bacteria from growing. How do we do that when we want to smoke meat or sausage? The meat can spend hours in the danger zone. A whole pork shoulder or beef brisket can be slow smoked because the outside of the meat is where most of the bacteria should be. The outside of the meat is usually rubbed with salt and spices or the whole piece of meat has been brined. The salt kills or slows bacterial growth and the temperature of the outer portion of the meat quickly rises above 140° F. Also, the smoke is deposited on the outside of the meat and this also kills bacteria. This is how meat can be slow smoked for 12 – 14 hours with little risk of making someone sick. If you like to inject brine into the meat, you should consider the possibility of introducing bacteria deep into the meat where it will be in the danger zone for a long time. Smoking sausage is a different story and is exactly why you need to cure the meat first (curing salt#1). First, the meat is ground, so all parts have equal probability of being contaminated and second, slow smoking sausage sets up perfect conditions for Botulism to grow. The center of the sausage may take a long time to warm up above 140° F and even longer to the final cooking temperature of 160 – 165°F. Also, sausages need to be slow smoked so the fat doesn’t render and drip out. As example, you might start smoking sausages at 130° for the first 2 hours to dry the casings. Then increase the temperature to 165° F until the internal temperature of a test sausage reaches 165°F (2 or more hours). Our ancestors have a long history of curing meats and making sausages. 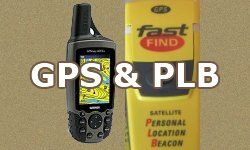 They were tough, knowledgeable people, but had little technology. We may not be as tough, but we have more access to information and technology than they had. If we make sure to keep things clean, use modern curing salts and pay close attention to temperature, we can keep these skills alive and not have to depend on industrial farming and processing for all of our food. The pink color of cured red meat comes from the reaction of Nitrite with Myoglobin, not from the dye. White meat, like chicken or turkey, with no Myoglobin, will not turn pink, or not as much, when cured. Morton Tender Quick has no dye, but has much less Nitrite than Cure No. 1, so more is required for curing (1 Tbs per Lb, recommended). Thanks for an informative post, as pretty much all of your posts are. In the paragraph about curing you say this. ‘The time period is long enough that the sodium nitrate should be converted to sodium nitrite’. I assume you meant it turned into something different. Hi Kyle: Yes, the sodium nitrate converts into sodium nitrite over time. Think of it as an extended time release when dry curing meat that requires a long time. Prague Powder #1 does not contain sodium nitrite and is used for meats requiring a short curing time. Meat requiring a long curing time should be cured with Prague Powder #2. You should not use Prague Powder #2 for meats that will be cured and eaten quickly. Is it OK to wash prosciutto under warm water? (Because the rind is so oily). Do you mean wash the prosciutto and store it back in the refrigerator? Or do you mean to wash it and eat it right away? Do what you want if you plan to eat it. But if you intend to store in the refrigerator, you can wipe away excess grease, but I wouldn’t wash it. Prosciutto is a dry-cured ham. If you introduce water, you also introduce potential “habitat” for undesired microbes. The chance of undesired microbes growing in the refrigerator is low, but why chance it. Water will also change the texture. You mentioned that cooking meat to 176F will kill botulism? I ask this because I’m wet curing (for 5 days with prague #1) some beef for making pastrami and was curious if any botulism spores that might potentially grown during the cure would be destroyed when I cook the meat. The meat will be hot smoked and then heated/cooked to 195F+. That is not exactly what I wrote… I said the botulism toxin is destroyed by cooking to 176° F.
“…the toxin which causes botulism is easily destroyed by cooking to 176° F (80°C)”. Botulism spores can survive boiling for a short time. Temperatures in the range of 240°F to 250°F (115°C to 121°C) are needed to kill the spores. The entire point of using the Prague powder/curing salt is to prevent the growth of botulism in the first place; as is using acid (vinegar) for canning vegetables where you don’t use the nitrites found in curing salts. If you follow directions carefully to add the correct amount of curing salts, the meat will be safe. Let me know how your pastrami turns out. We made brats with 50/50 deer and pork and high temp cheese using Excalibur seasoning and cure #1. It was red colored an after cooking on stove top… it tasted good but turned gray. I have never seen this before. Why did this happen? Is it safe to eat when it turned grayish? First thing, I am not going to tell you your brats are safe or not, because I don’t know anything about how your meat was handled or how your brats were cured. I am more concerned with your description of “red” than gray. Cured meat should have pink color not red. How much curing salt did you use? Who knows what additional ingredients, preservatives or food coloring you added with the flavor packs and with the high melting point cheese? As meat proteins are cooked, they are denatured (chemical/physical structure is changed) so they can change from pink to tan to brown and even gray. Oxidation also happens after air and heat are combined. You will have to make the call to determine if your brats are safe. 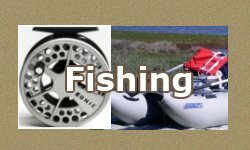 Double check the amount of curing salts you used. Just make sure not to eat green sausage. The meat was was normal colored ….in the beginning. I just never knew it turns grayish after cooked. I used high mountain snack stick. I ground and stuffed the casings last night. But couldn’t smoke and cook it all tonight. Will the last 8 pounds of already stuffed sticks be OK one more day in fridge or does it need cooked tonight? 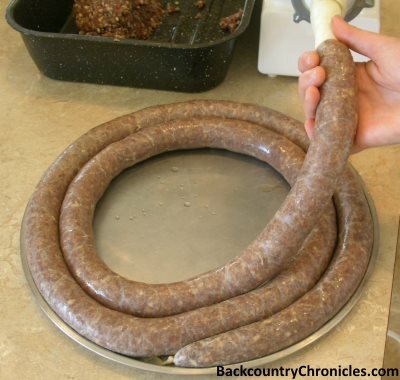 Hi Thomas: My post provides guidelines for a DIY sausage making. I have no idea what is in the kit you used, perhaps they include instructions and that is where you other question should be directed? But if the mixture is in the refrigerator at less than 40°F, bacteria growth will be minimal. The FDA calls any temperature between 40° – 140°F “The Danger Zone”. That is a simplistic approach, but will keep most people out of trouble if they follow that guideline. Basically, most bacteria can double their growth rates with a 10°C (18°F) increase in temperature. So bacterial growth will be very slow at 40°F and a little bit slower at 39°F. If your fridge is actually at 45°F, bacteria will be growing a little bit faster, but it should be OK for another day or so until you cook it. Most of the problem with slow smoking sausages is they will be in anaerobic conditions (no available Oxygen) and at temperatures between 80°- 140°F for a long time. Those temperatures will allow bacteria to grow quickly and it also has the potential to grow Botulism. That is why the meat needs to be cured with the curing salts; Curing Salt # 1 (A.K.A. Prague Powder #1 or Pink Salt #1) or Curing Salt #2 (A.K.A. Prague Powder #2 or Pink Salt #2). I have an old recipe for sausage (40 yrs old). Is there a difference in today’s curing salt from curing salt 40 years ago. I want to make this recipe but am worried about using to much curing salt. I followed this exact recipe 40 years ago and it was awesome. I am sure the old recipe is good, but but don’t worry, just make sure you follow the directions on the package for the curing salts (But it should be 1 tea spoon for 5 lbs). For short term curing like you describe, you want to use curing salt #1. Use Freeze-Em-Pickle when curing the meats which will keep that “redish” color and preserve flavor. Freeze-Em-Pickle is an old product, which I can’t find any evidence online that it is sold anymore. Scott can you still buy it? I found a 1922 book online that talks about using it to cure hams. If so, this is not intended for short term cure like sausage, and especially not for smoked sausages. Evidently, this cure uses a fair amount of sugar. This may be OK if I wanted to sugar cure a ham, but not something I want in all of my sausage recipes. I also would not use this unless I could see a full list of ingredients. The documents I found online were very old, before ingredient lists were required (not that they are very complete today). It is possible that Freeze-Em-Pickle contains nothing except nitrate/nitrate and sugar. The amounts of nitrate/nitrate needed to cure meat is very well understood today. Who knows how much they used before the 1930s. Another reason I don’t think this product is available, I found where the trademark has not been renewed (amazing how you can get lost on the internet). Hi, great article. If I missed this I’m sorry but how long do I need to cure my venison sausage links before cooking them? I’m making some with 50% beef fat as a first time try. Thanks for the photos Sid. Looks good to me. Sid says this is about 15 lbs. Here you go! My wife says it’s the best ever! Hi Sid. You do not need to wait on the cure to take effect. I am sure there is a short time factor for the salt and nitrate/nitrite to kill bacteria and fungus, but that happens during the mixing process. But curing salt will not work forever. Make sure to keep everything that touches the meat clean and cold and get it back in the fridge or freezer as fast as possible. If your sausages are going in straight in the freezer, you probably don’t need to cure them at all because there is little chance for bacteria to start growing. If you are going to smoke them, you definitely need to add curing salt because bacteria will start growing while the meat is slowly heating in the smoker. Good luck on your venison sausage. Send me a pic and I will post it here.